It was supposed to be my second ever marathon. I dug out last year's training program which was a 12-week program from Runners World. 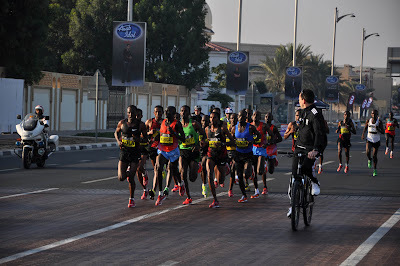 It suited me well to prepare for the Dubai Marathon 2011 where I finished in 3:58:01. I was very proud about the sub 4h in my first marathon. 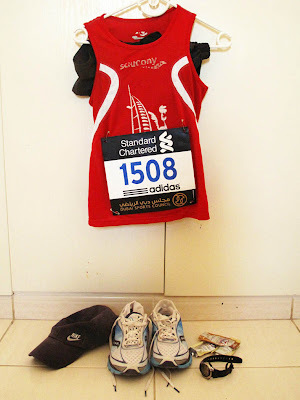 In fact, it almost went too well, as I didn't really know where to set my new goals for the next marathon. I didn't hit the wall at 30k. I had negative splits (running the first half slower than the second half). I was already under 4h. Going down to 3:30 sounded a tad too ambitious. But then back in October, most of my running friends started training for the Dubai marathon, were talking about their long runs and increase of their mileage. It's contagious, and I didn't want to feel left out. So I jumped on the bandwagon. My weekly mileage was not much more than 20-25k when I started the program, as it was still pretty hot in Dubai. I jumped right into it and increased the mileage by more than 100% which is not advisable. But I was ready to slow down a little by giving myself 13 weeks for the 12 week program. I kept a weekly journal of my training. You can read here of my weekly ups and downs of the training. All in all, the training went really well. I didn't have any setbacks by falling sick or getting injured. For the suggested speed training sessions, we set up a running group on Sunday nights where everyone training for a marathon could come and do those (sometimes quite grueling) long intervals together with other people. It definitely helped a lot to train with a group, seeing each other's progress and also hearing other people's concerns, motivational ups and downs or injury problems. 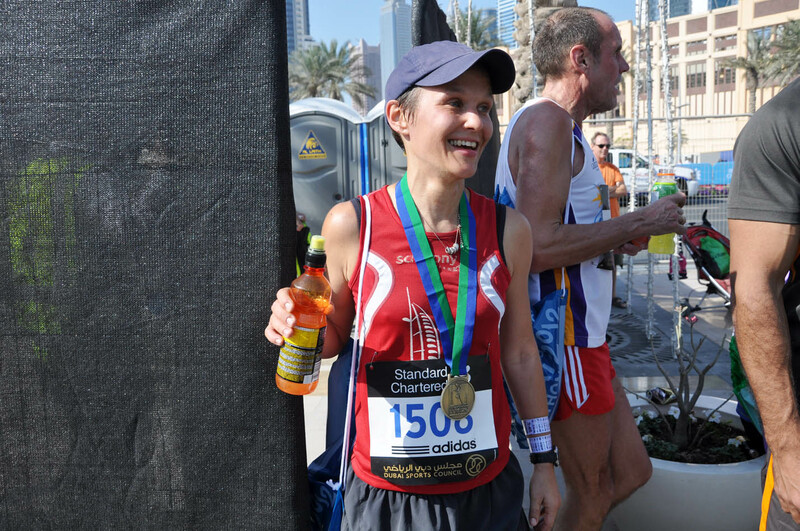 A sense of being part of a marathon community set in and made me feel very good. We'd question each other about previously run marathon, race tactics, goal times, running equipment, nutrition, etc. The usual runners talk. 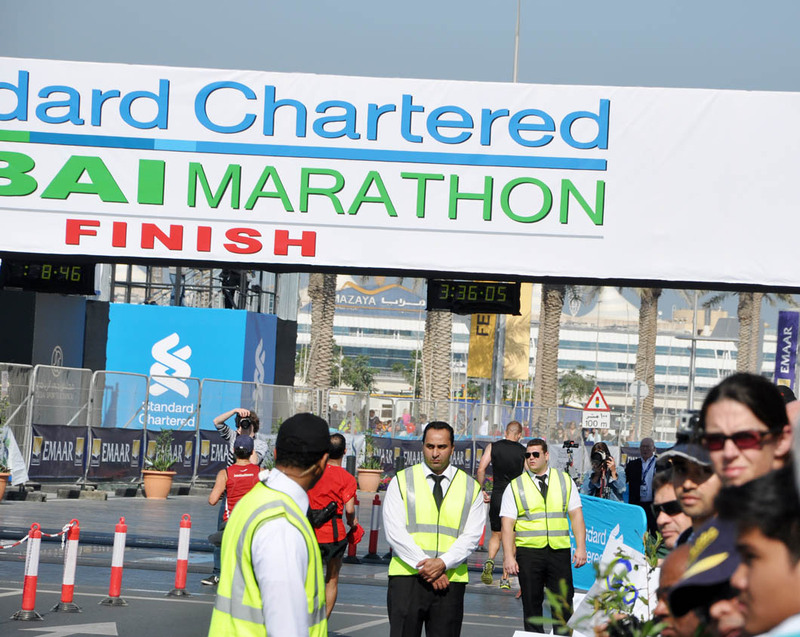 The goal I set myself was running the marathon in 3:45. The pace at the speed training as well as the long runs was laid out to prepare me for a 3:45 finish time. 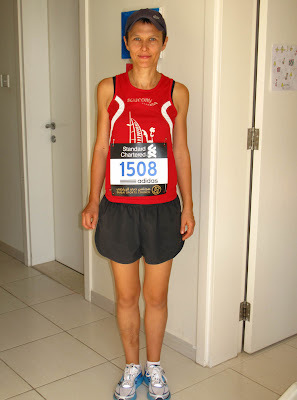 I had a couple of Half Marathon and 10k races while training for the marathon, and my PBs were already tumbling. Surely a confidence booster, but only after the longest long run of 36k, about 4 weeks before the marathon I felt I could do it. I have always believed in rested legs. From about two weeks before the race, I didn't run much. Mainly, because I was scared to get injured. My last run was 5 days before the marathon, a 12k run at marathon pace. During that run I knew I was not injured and unless I would be catching flu or some other nasty infection, I'd be running that marathon. You can see that on day 2 I was already slowing down with the carbs, as I just couldn't eat any more. After the 2 muffins on the last day before the race, I thought I could never eat another single carb in my life ever again. I felt full to the brim. The light salad in the evening was all I needed. I went to bed by 10pm. My alarm was set for 4:40am. I expected to be up all night with excitement and nervousness. But I slept well and actually needed the alarm clock to get up. After a bowl of porridge with banana I went to the race site. 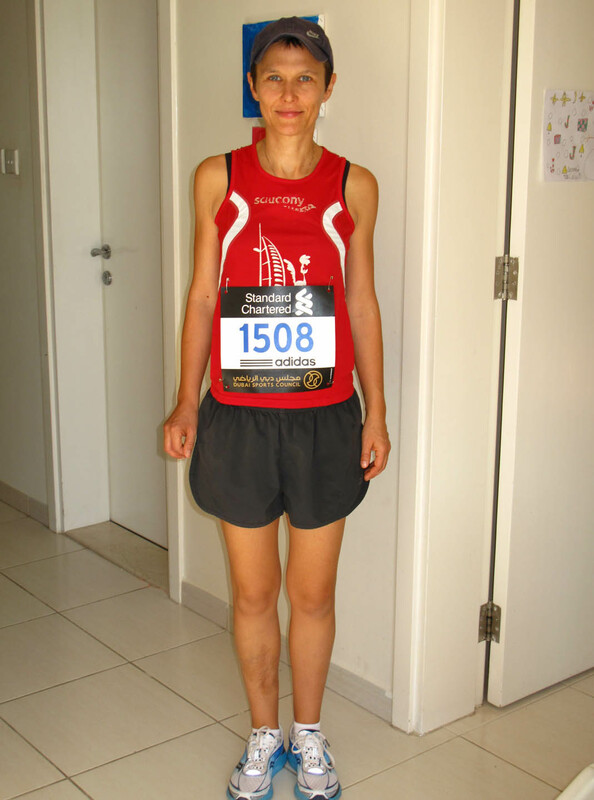 I arrived with plenty of time to take in the atmosphere, drop off my bag, visit the loo, chat to friends and finally line up at the start line. It was quite cool, around 15C. I felt excited in a good way, and at the same time pretty calm. I was wearing pace bands for a 3:45:00 finish time around my wrist. An average pace of 5:20min/km would get me there. I wanted to run the race with negative splits (e.g. running the first half slower than the second half), as I believe that this is a crucial point in having a good and successful race (especially those long ones). The gun went off and and I was in no hurry. I went off with the flow and did the first km in about 5:38min. By the 3rd or 4th km I was up to the time that would bring me home in 3:45:00. By km 8-10 I realized that I was running at an average pace of 5:15min, faster than my goal pace. I wanted to do negative splits, really reserve my energy for the second half of the race. But then I told myself, that I was feeling very comfortable at the 5:15min pace. I was certain I could still increase my pace. On the course were a few U-turns where I could see who was in front of me and how far they were away from me. I saw a few familiar faces, and was hoping to catch up with them in the second half of the race. My family and a friend were at the roadside at 16k, cheering me on as loud as they could. About 100 other people standing there now knew my name :-) It felt good to see them, I grabbed a banana from my sister and ate half of it. Just a few kilometers earlier, at about 12-13k, I had my first GU gel. 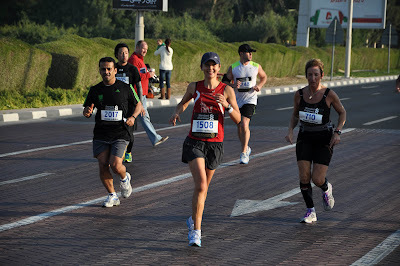 But once I had the banana in my hands, I realized that this is my favorite food during running. I crossed the halfway mark at 1:50:31. With a 3:45 time in mind I was about 2-3 minutes faster than planned. I felt confident and good and was joking to myself, that i should speed up a bit during the second half because I needed to go to the loo which I only wanted to do after the race. My average pace went up on the second half. 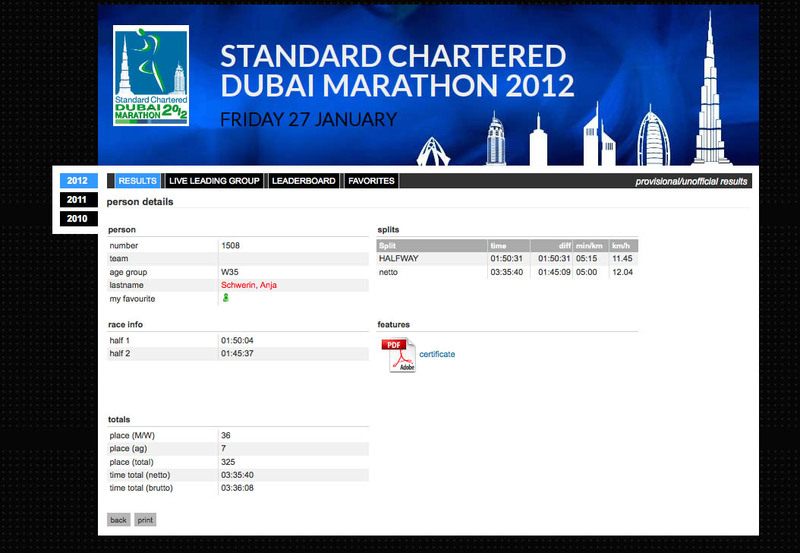 I didn't quite check my pace per km, I was just making sure that I would finish under 3:45:00. I grabbed every piece of banana that was offered by onlookers, and just kept running. At times, I felt a little bored, as there was no-one to talk to. I was also waiting for a friend to come by who promised to cheer on the runners on her bike. She ran the 10k race that started 15 minutes after the marathon and would jump on her bike to support us marathon people after her race. From about 29k on I kept on overtaking the people that I saw so far in front of me at the beginning. That gave me a huge confidence and motivation booster which was much needed. From about 34k on, each single kilometer felt like three times the length. I didn't take in much of the people or scenery on those last 8k. I was just looking for the next big blue pillar on the roadside which would mark that I completed yet another kilometer. I saw my friend on the bike at 35k, and remember telling her that I would finish in under 3:40 if I was able to keep up the pace. She said that I looked much fresher than anyone around me; another booster that kept me going on the last stretch. 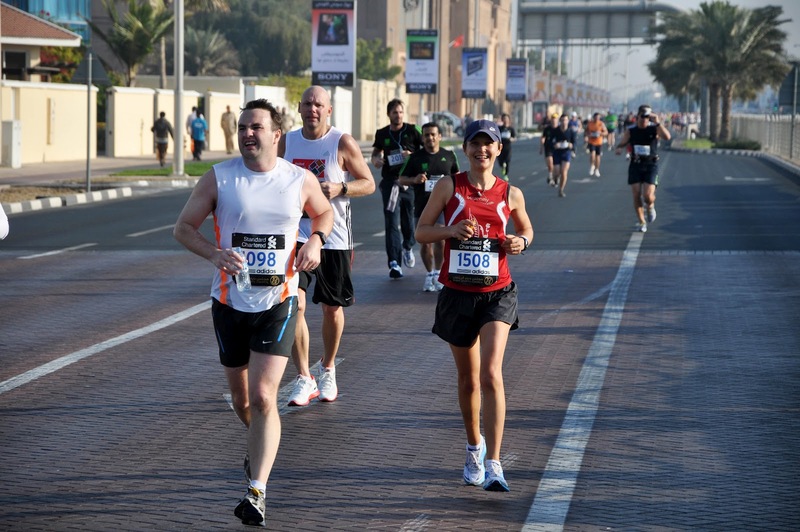 I put it as my task to overtake other runners, one by one, to give me something to do. I checked my pace at around 38k, and realized that I ran at 5min/k. 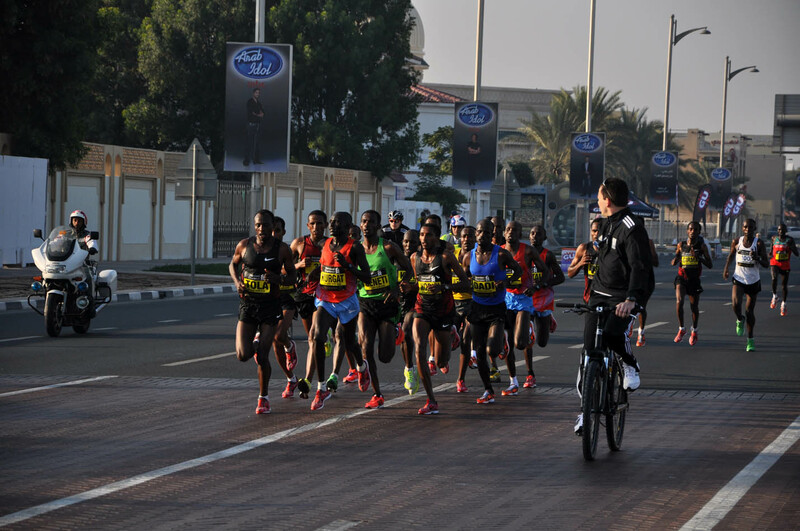 However, each kilometer still felt like three times the distance. Only on the last few hundred meters, I was able to get the last reserves out of me and sprinted down to the finish line. I saw fellow runners and my sister at the roadside cheering me on. We high-fived each other as I ran past them. 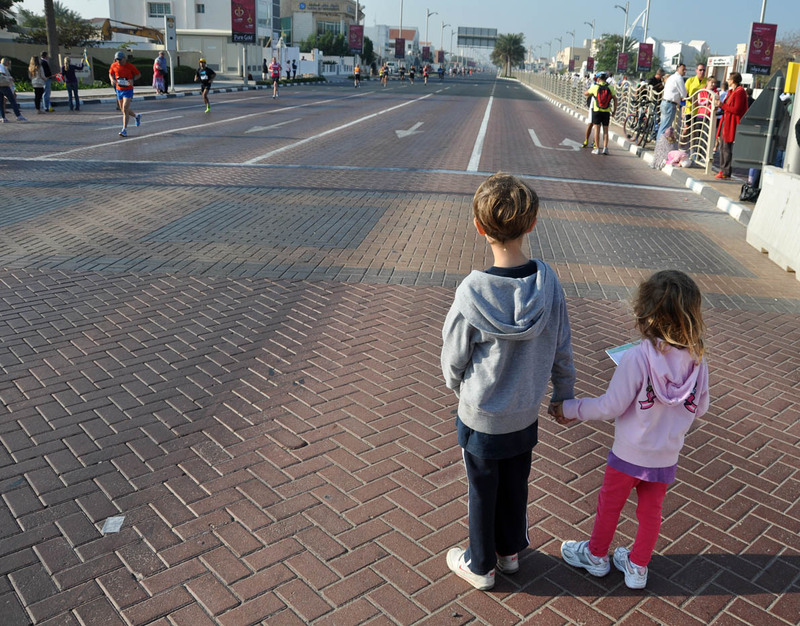 They could see the clock at the finish line and knew my time when I crossed the finish line in 3:35:40. I was over the moon, to say the least. I would have never thought, I was able to run that fast. 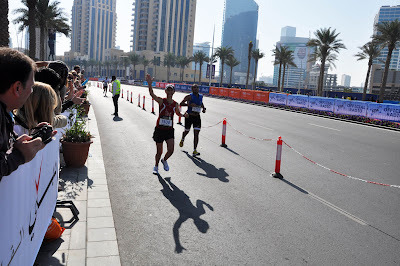 Everything worked out just beautifully: the systematic training with the slow long runs and the speed training, the amount of training, and my race tactics by running the race with negative splits of 1:50 and 1:45. That translates into a average pace of 5:15min/k in the first half, and 5min/k in the second half. I finished 36th woman (out of 337 and that includes 16 Kenyans and Ethiopians who took the first 16 places), and 7th in my age group. I am so proud. I am writing the last sentences of this report two weeks after the marathon. I have calmed down now, the adrenaline levels are down to normal. But for about 10 days I had the biggest smile on my face. I bet I even smiled in my sleep.